I cannot believe how fast the time has flown. Tomorrow I head to Belize to the carribean islands and hopefully a visit to the lighthouse reef - wow!! My time in Guatemala has really been amazing. It is such a beautiful country with so many wonderful and varied things to see and do. The last few days Kate and I headed up north to Flores. We did want to go to Rio Dulce but despite being not far from Lanquin there are no concrete roads and it proved almost impossible so we decided to head up here a day early instead. Rio Dulce is supposed to be really nice and its a shame we didn´t get there however I always think its better to leave somewhere when you could have seen a little more rather than see everything and then feel like you have too many days left over!! Being in the jungle/rainforest there are loads of animals. We saw parrots and toucans in the evening, and at the very end of our visit yesterday we even saw some spider monkeys jumping in the trees and eating some fruits / leaves. I love monkeys so was very excited to see them above us. 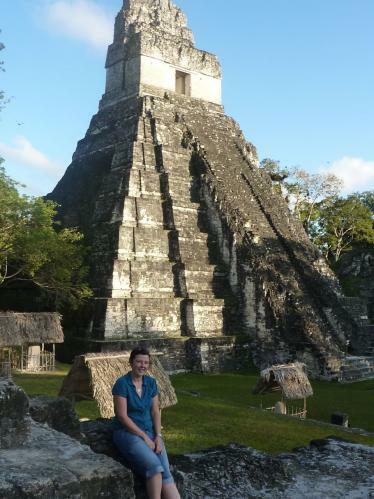 We spent the night at Tikal in one of the three hotels there. Dinner was lovely and although the room was nice we didn´t get much sleep as I seem to have caught a nasty cold - probably from jumping in the freezing waters at Semuc Champey on Monday... We got up at 5.30am for our tour - way too early as we had forgotten that Guatemalan time is always about an hour later and the tour didn´t start until just before 7am. It was really amazing though because as we walked through the jungle we could hear the howler monkeys screaming to mark their territory. There were loads of birds singing and we felt like we were in a really magical place! We saw lots more temples, climbing to the top of a few of them. The views are stunning - you see the jungle for miles around with monkeys, parrots and other wildlife sitting in the branches with the huge temples poking out of the top of the canopy!! The only downside was the extreme heat and the fact that I couldn´t stop sneezing! Our guide found a tarantula which wasn´t poisonous - apparently, I was taking no chances though and moved away! Excellent trip and excellent time in Guatemala. It is a country that I would definitely recommend visiting - although you just need to stay out of Guatemala City. One of the guys on the house building project was held up at gunpoint and had to hand over his wallet - however it was at 3am so I guess its to be expected (secretly a bit jealous - what a great story that would be!). It is weird that almost everywhere you go here you see people with guns (all security guards) but you get used to it and unlike America all these ones are very friendly and will have a little chat with you!! My next stop is Belize and then onto Honduras at the end of next week. More stamps for the old passport - woohoo! I hope everyone is well and thanks for all the fun messages. It is always nice to hear from home!